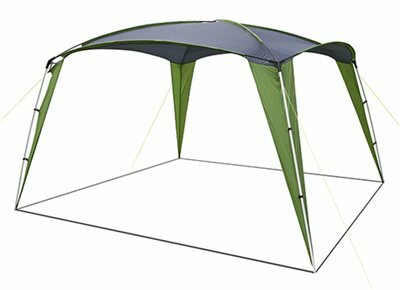 This Events Shelter is ideal for the beach, parks, camp sites, picnics and garden events and will shelter you from harmful rays and light showers. The events shelter is easy to assemble with guy lines, steel poles and pegs. Decades of camping all over the USA have made an over-the-picnic-table shelter like tis one an essential. Most I have owned were expensive, were fairly complicated to set up, were too small in actual overhead coverage (the "footprint" size is of no consequence when it is pouring rain), and were much too low at the edges. This unit is large where it matters, it assembles easily (about average), and it has more than adequate headroom even at the edges. I rated it 4 stars instead of 5 since it has steel poles, adding some weight to the bag and probably some reduced longevity.